P&H offers inspection services for some of North America's largest oil & gas and energy companies. (www.phinspectionservices.ca). The company has approximately 35 staff (3-4 admin staff and 30+ field staff/inspectors). P&H had an outdated and inadequate desktop database system that was becoming very difficult to manage for office and admin staff, who are the primary users of the software and manage client information, projects and assignments. Given that the employees work from home or remotely, it was impossible to effectively collaborate using this database system. Invoices and time sheets were done manually and often had errors and were incorrect, which led to many different organizational headaches. That changed for the better with the new database web application designed by Selaris, an Edmonton web design and development company. 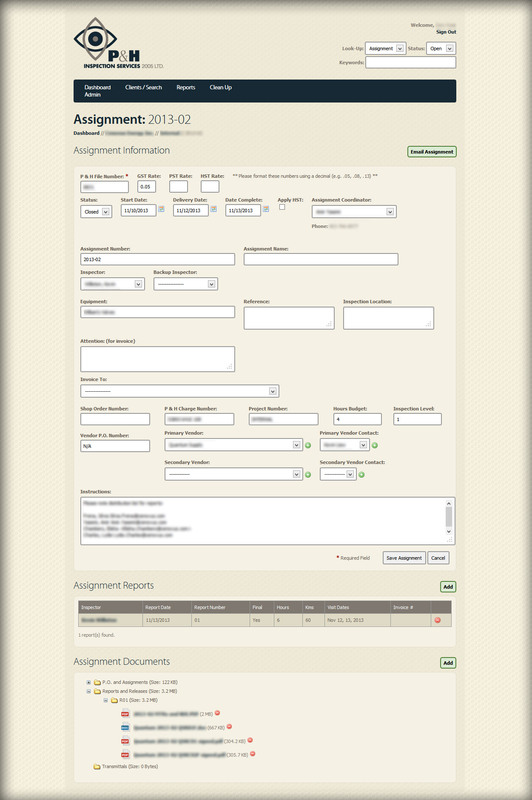 Each and every work assignment is now entered and tracked within the system. The 30+ inspectors receive email notifications of upcoming tasks assigned to them in real time. Each inspector is able to login to an "Inspectors Area" to view information about their own assignments. Information can be accessed at any time, day or night, and from any internet connected device. 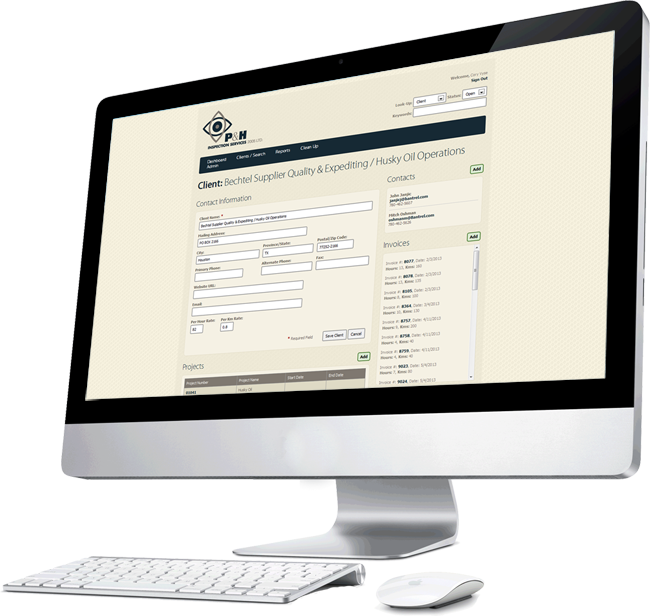 The system also automates the creation of 100 - 200 invoices per month with just a few clicks (a major time savings). In addition, each inspector can create his/her time sheet through the system, based on a date range. The system already knows what work they've done, so it takes just a couple of button clicks to prepare a spreadsheet covering an entire month's worth of work. All data is now available live for instant access by company employees and contractors. There is no waiting to update. It is "Live". There has been virtually no down time with the system. We have total control as only the directors have permission to input data. Our inspectors are able to retrieve all data they require and then forward reports etc. for upload as required. We are now able to assign multiple inspectors to the same assignment to allow access to previous reports and documents for vacation coverage or where multiple inspectors are used on the same assignment. The system is very "User Friendly". The database fits us, not the other way around. We now have what I consider the "easiest and simplest access" to all of our data files. We are still able to keep the "Private Files" private. For more information on how we can help your organization become more efficient, contact us today. You can also learn more about Selaris and why we're a great choice to be the web development company for your business.